Time for another random “what’s been going on” post! Wednesday morning I drove Todd to 30th Street Station in Philadelphia so he could catch the train to DC. Traffic was normal week-morning traffic. That is to say it was horrendous. But I had a 20 ounce cup of coffee, good music on the iPod and fabulous, uninterrupted conversation with Todd. I guess enjoying being stuck in traffic with my husband for an hour and a half just means we really need to get out more. The drive is pretty as it winds through hilly Conshohocken and Manayunk with the Schuylkill River on one side and low cliffs of black rock and forest on the other. Across the river are beautiful 200 year old churches with tall steeples and stone bridges with big arches. Eventually the rocks give way to Fairmount Park, a 9,300 acre park system made up of 63 different parks including the oldest zoo in the country, Philadelphia Zoo. And then (and this is my favorite part) there’s a bend in the road and the city comes into view in the distance. 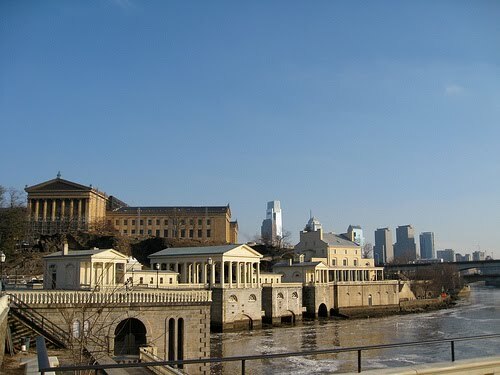 But first you pass the historical architecture of Boathouse Row, the Philadelphia Water Works and the Philadelphia Museum of Art with the modern skyline of Philly just beyond. It’s one of my favorite views and it never seems to get old. My thirty-fourteenth birthday was Thursday. In my mind it’s just another day because thirty-fourteen isn’t a milestone year. Not only that, but it wasn’t the best day for a celebration. Todd was out of town and we had day one of our Thanksgiving Feast at preschool (I now know that food service isn’t my gift either). The Feast was fun but both Leanne and I had tired feet by the time we left. That morning before I left for work the kids brought me my present from Todd. It was An Echo In The Bone by Diana Gabaldon and is book 7 of one of the best series ever. If you don’t know anything about the Outlander series, let me just tell you this. It’s all consuming and the books are long. It is an investment in time, but so worth it. The shortest book is the first one (Outlander) and it’s around 600 pages long. I usually read the entire series before each new book is released, but didn’t make it this time because my reading mojo is gone. So I’ve started AEITB and I feel like I’m getting to visit with long lost friends. I hope to read the entire series all over once I finish AEITB. When I got home from work I received another present from the kids. A gift bag full of coffee samples, Mrs. Fields’ truffles and a purse-size 2010 planner. One of the coffee flavors was Jack Daniels’ and my smarty-pants son told me the next morning, “Now you don’t have to put whiskey in your coffee before you go to work, Mom.” They also ran to Wendy’s and got dinner for us so I didn’t have to cook. Then we watched our DVR’d Glee and Castle and it was lovely. The other night I was trying to microwave potatoes and after they had cooked for 6 minutes I took them out to stir, returned the bowl and hit 6 minutes again. This time the appliance made a horrible sound so we decided cooking them on the stove top would be better. Fast forward a couple of days. We hadn’t used the microwave and I decided to give it a go. I thought maybe it had been the turntable doing something wonky. So I put in a cup of cold coffee to reheat and hit 1 minute. It still made the horrible sound so Sookie and I stood on the other side of the refrigerator just in case it blew up. Thankfully there were no sparks and no smoke, just a beeping when the minute was up. Unfortunately the coffee was still cold. So it looks like we need a new microwave. Just what I want to spend our money on this time of year. How long do you think we can live without one? I sort of remember life before their existence. Back when we had a rotary dial on the phone and four channels on the TV. I guess that means real popcorn over the stove, too. Oy! Last, but definitely not least, Todd and I just saw a preview of the season opener for Chuck!! Now I can’t wait for January! Mmmm, pretty pictures! I love how your kids helped you to celebrate! Thoughtful squirts you've got there!Now are the kids planning a memorial service for the dearly departed microwave? If so I want to hear about it, too! Yeah – I think I'll keep 'em. I LOOOOOVE time alone in the car with the husband. We have the best conversations there.And yay for Chuck, and birthdays and smart alec sons. The photos are fabulous…they look like scenic Calendar pictures…especially the panoramic shot of the houses on the water. Gorgeous.Loved Taylor's comment about the JD, lol.We haven't had a microwave since ours bit the dust in our last house. Apparently the chrome rack as extra kitchen shelving wasn't a good idea for a place to set the microwave. It was shooting sparks out of it as it breathed it's last. Pennslyvania is one of the places I want to visit so very badly. It looks like such a beautiful place, and your pictures are great!Your birthday sounds fantabulous. What wonderful gifts (I have friends who love Gabaldon, but I've never read any of her stuff. Maybe I should give them a try), and the Jack Daniels comment cracked me up!I'm also excited about Chuck coming back…but mostly about "Lost." It's my obsession and it comes back in the new year too!Happy (late) Birthday!!! yay for chuck! and btw, i heart your randomness. feels like i just sat and chatted with you a little. though not enough. can't wait to do the real thing!! !